This course equips learners with basic counselling skills for any situation. They are then further equipped to conduct pre- and post-HIV test counselling. Attention is given to how to counsel and support clients after testing to live an optimal life, whether they test positive or negative. 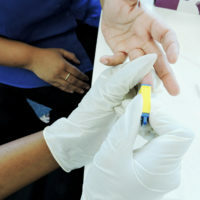 Learners are taught how to conduct the HIV Rapid Finger Prick test according to national Department of Health guidelines.